Just like natural teeth, dentures collect bits of food, plaque (a sticky deposit, mostly made up of bacteria) and tartar (hardened plaque). By keeping them . clean, you can stop decay any remaining natural teeth and help prevent gum disease (which can lead to tooth-loss). It's also good for your comfort and appearance to clean dentures, as dirty dentures can make your mouth swollen and sore. How do l look after a denture? Clean the denture over a basin of water so that it does not break if you drop it. Brush the denture inside and out every day. Use a soft-to- medium brush so that you do not scratch the denture. Use your normal toothpaste, or soap and water. Then rinse the denture. 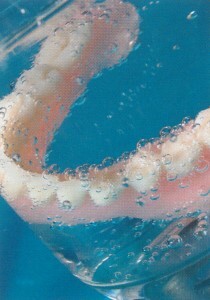 Ask your dentist about denture-soaking solutions. Soaking a denture will not clean it. You also need to brush it. Rinse the denture before you put it back in your mouth. Ideally, dentures should be left out of the mouth for at least four to six hours, preferably eight hours, in every 24. However, if you find this impractical or embarrassing, you should still make sure you clean your dentures by brushing with toothbrush and toothpaste. Keep a denture dry or in a denture - soaking solution when you are not wearing it. These solutions are mild disinfectants available at all chemists' shops. By keeping a denture clean, you help keep your gums and teeth healthy and avoid bad breath. People who wear dentures sometimes get an infection called oral thrush. Thrush is more likely if you wear the denture all the time. Good denture hygiene is important for preventing oral thrush.